It is with pride that Rollins College and the Winter Park Institute welcomed back the twice-Poet Laureate, Billy Collins, who read selections from his collection Beyond the Birdbath: Poems from Several Time Zones. These poems use travel as their focal point, and they retain Collins’ subtle, gently nudging wit. In 2002, as U.S. Poet Laureate, Collins was asked to write a poem commemorating the first anniversary of the September 11 attacks, and the fall of the Twin Towers and the World Trade Center. The reading was held in front of a joint session of Congress outside of Washington D.C.
Collins has received fellowships from the National Endowment for the Arts, the Guggenheim Foundation, and the New York Foundation for the Arts, and has taught at Columbia University, Sarah Lawrence, and Lehman College, City University of New York, where he is a Distinguished Professor. On Rollins campus, Collins is most widely known for writing the inaugural poem for President Cornwell, which is on display in the Olin Library. Richard Frost, husband of poet and English Professor Carol Frost, knows Billy Collins and spoke on his character, “Billy is a much more profound, complicated person than most people assume… Y’know, people read his poetry and they think he’s that straightforward.” Both Richard and Carol Frost consider Collins to be a dear friend and a powerful voice of the craft. Patrons from Rollins College and the Winter Park area attended the poetry reading. But no matter where they came from, each attendee was united by one thing: a love of poetry. 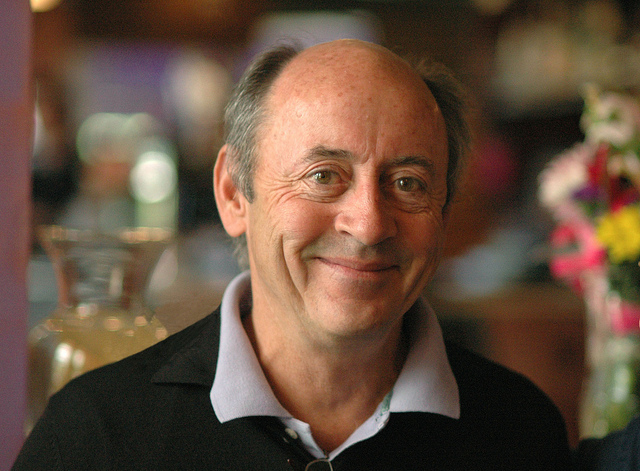 Billy Collins will be returning to Rollins College in January as a part of the 2018 Gladdening Light Symposium, a weekend-long event discussing spirituality in poetry, music, and film. Alongside Collins, acclaimed movie critic with The New York Times, A.O. Scott, and Academy Award winner for Babel and Brokeback Mountain, Gustavo Santaolalla, will also be featured. This event is completely free to Rollins students, faculty, and staff, but advanced registration is required. For more information, contact Rev. Katrina Jenkins.